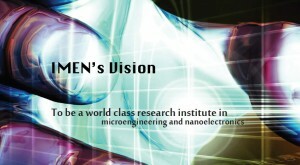 To strengthen and discover new knowledge in micro and nanoelectronics, micro-electromechanical systems/nano-electromechanical systems (MEMS & NEMS), advanced devices, MEMS & nanotechnology systems, organic & printed electronics, advanced packaging technology and photonics & nanophotonics through research and development activities. To develop capacity building in micro and nanoelectronics, micro-electromechanicals systems / nano – electromechanical systems (MEMS/NEMS), advanced devices, MEMS & nanotechnology systems, organic & printed electronics, advanced packaging technology and photonics & nanophotonics. To create local human resource in micro and nanoelectronics, micro-electromechanical systems / nano-electromechanical systems (MEMS/NEMS), advanced devices, MEMS & nanotechnology systems, organic & printed electronics, advanced packaging technology and photonics & nanophotonics. To promote public awareness of the contributions of microelectronics in development of the nation by organizing public lectures, seminars and outreach programs and producing publications. To strengthen national and international networks in order to put Malaysia in global perspective. To be the nation’s reference center in the area microengineering and nanotechnology.